I find it weird that the last bus to the border of Cambodia-Thailand being Aranyaprathet leaves Siem Reap at 8am.The next trip would be either midnight or 2am.There is already a direct trip from Siem Reap to Bangkok but it's quite pricey.By bus, the regular fare is just $6/pax.You pay extra for convenience of course as it means not changing bus when you arrive at the border and line up at immigration on your own.With the direct bus, somebody will collect your passport and assist you at immigration. 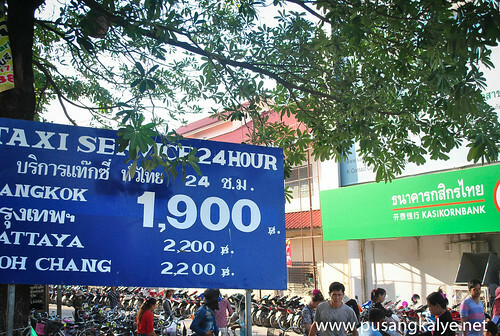 For more flexibility, one can hire a taxi.The border is around 2 hours from Siem Reap and the taxi rate is from $25-$30. We asked our tuktuk driver to find us a taxi and he did so fast.It pays to have connections.If you are uncertain,hotels do have contacts too so you can always approach the front desk for assistance.Rates are standard and posted on announcement boards at hotels. We left Siem Reap at around 3pm right after our day tour of Angkor and a quick lunch near Golden Temple Villa where we stayed overnight. Road condition to the border is very good. 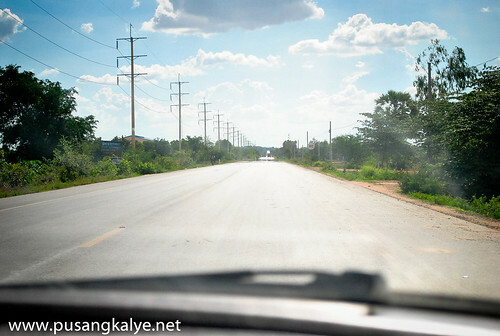 Didn't actually noticed any bumps at all as the highway is fully concrete with asphalt finish.This is in direct contrast to the highway from Phnom Penh to Siem Reap. 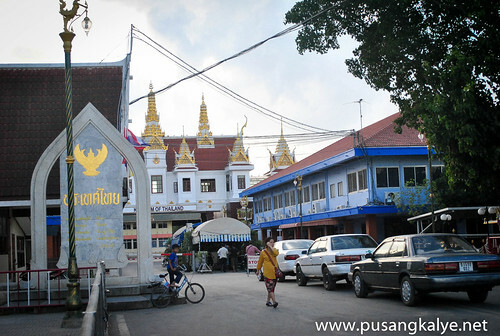 The Cambodian side of the border is Poipet. Recognizing that we were near,I reminded our taxi driver to take us to the legitimate immigration office as I read on online forums a lot of scammers both on the Thai and Cambodian side.Our driver was an honest man so we didn't have any problem.He dropped us around a circle and the moment we got out of the car,a few men approached us for transportation assistance at the Thai side.I asked our driver if the guy is legit and he gave his nod so we followed his lead.He gave us his business card so we were also a little less suspicious. 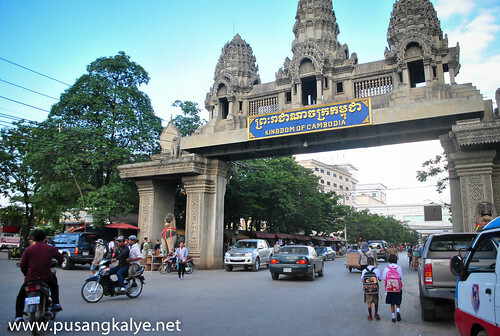 He directed us to the Cambodian Immigration where we had our passports stamped for exit. The immigration office is also along the circle.It is a small office and we had to line outside---an open air area with roof to protect from the sun and/or rain.The queue was short so we were cleared in a few minutes.We then had to walk for a few meters to get to Thailand immigration with the guy offering transportation still guiding us where to go. At Thailand Immigration, there was no line at all.We were the only one inside at first so it felt a little weird.It was only 5:30pm so I was expecting a big crowd but there were only us and later on a few more locals.I heard the border closes at 8pm.We were still early.Passing through Thai immigration was also quick.No hassle at all. Once cleared of immigration, the 'transpo guy' was already waiting for us at the other side.He directed us to one of the many big vans parked along the streets.Welcome to Thailand! Our destination----Bangkok. It would be another 3-4hours of land travel to Thai Capital so we requested for a quick toilet break.Toilets are located near the public market of Aranyaprathet I learned that there is another grouping of transport companies offering taxi and van services to different parts of Thailand including Pattaya. Should I have known earlier that it is possible to heed straight to Pattaya from here, we would have gone to Pattaya first and stayed there overnight.We played it safe so we heeded for Bangkok as originally planned.I am confident about my research about Bangkok and Pattaya was not really a priority. I saw in online forums that this is quite expensive.But it was already 6pm when we cleared immigration and amazingly, nobody else is on their way to Bangkok.Really strange.Kami lang pasahero. At least,among these vehicles.The driver offered that we pay 350 Baht each and we can leave with only ourselves in it but we didn't agree.We waited for a few more minutes but nobody arrived so the driver had no other choice but to take us --and our 300 Baht/pax --- and left for Bangkok.The van again felt like private hire coz we were the only passenger.Not bad for 300 Baht, we were able to stretch our backs on the way to BKK. Road condition to the Thai Capital from Aranyaprathet s really good.We passed through highways and more highways.If not for the good road system,travel to Bangkok would have been longer and more rigorous.We stopped at a 7/11 store nearby a gas station an hour away from BKK. 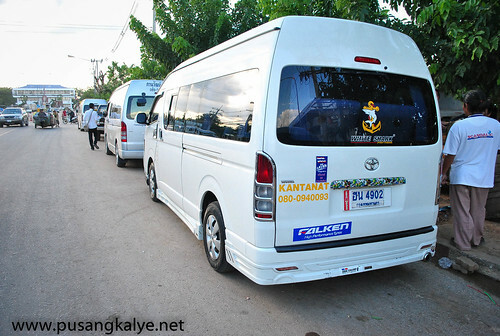 Another good thing about these vans is that the usually drop you off the area where you are headed in Bangkok, meaning, where you booked your hotel.In our case, we booked for Khao San Road which is of course a very popular destination among backpackers. 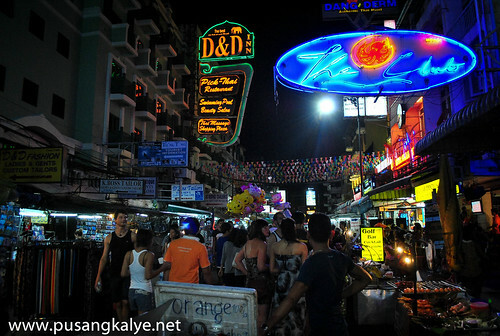 The van dropped us at the junction and from there walked a few meters to Khao San Road.